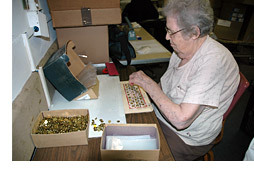 In addition to the seniors from Daughters of Miriam Center, in 1985, the Workshop entered into a pilot program with the Division of Developmental Disabilities (DDD) to provide day program services for developmentally disabled adults looking for work. It was considered revolutionary for the time, since no other program had mixed two diverse populations before. While DDD officials were originally skeptical, and started by sending only three clients, they were soon won over by the outstanding results. 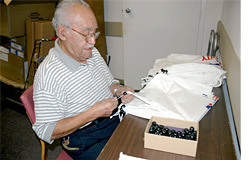 All program participants engage in sub-contract work that includes, but is not limited to: light hand assembly, packaging, sorting, collating, gluing, stapling, heat sealing, and shrink wrapping. The benefits are numerous to both populations. The elderly have a chance to interact with younger people while those with developmental disabilities learn valuable life skills and socialization skills. 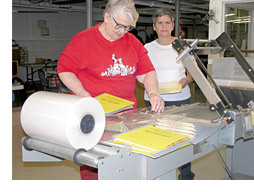 The participants in the Fred Ables Memorial Sheltered Workshop are not the only ones who see results. Vendors who utilize the Workshop’s services are always pleased by the accurate work, delivered on-time at competitive rates. 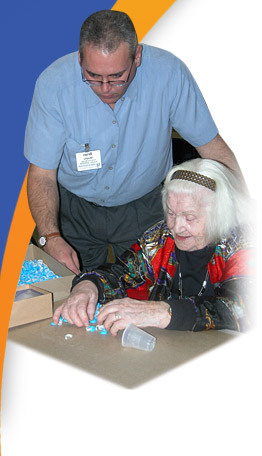 Since its inception in 1961, the Fred Ables Sheltered Workshop has provided quality sub-contract work to hundreds of different companies, from small local businesses, to multi-national corporations such as Eastman Kodak. For more information contact the workshop manager by clicking on the link or by calling 973-253-5294.